The weather is getting warmer, days are longer, and all I can think about are salads, green smoothies and lemon water. Are you feeling the same? If so, it’s a good indication that your body is shifting gears from a Winter supporting diet to a Spring one. Spring is the season of purification. Greens, additional water and a lighter diet overall, allows our body to slough off our winter ‘coats’ (excess weight, built up mucus, etc.) and prepare us for the year ahead. Our systems are reset, we’re given the opportunity to gain a new perspective as the new year approaches, and we’re ready to enjoy the outdoors in all it’s glory! If you’re an intuitive eater; following the queues of what to eat solely based on what your body says it needs, chances are your body is already making the shift. If you’re in the process of becoming more intuitive, steering your body in the right direction will help to set everything in motion. Beginning the day with a couple of light stretches, 2 cups of water with a squeeze of fresh lemon juice and opting for at least one fresh salad a day will do wonders in signalling your body that it’s time to cleanse! Oh yes, and lots of green smoothies will help, too! Spinach, kale, and collards are all fantastic at supporting our bodies through spring detoxification. No supplements or massive restrictions necessary. 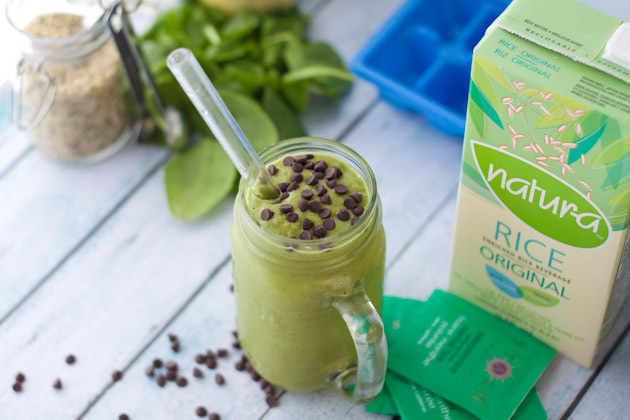 Providing the greens are organic; because greens are one of the highest pesticide crops, our green smoothies can help to improve digestion, increase energy, lower inflammation, regulate metabolism, boost our vitamin and mineral intake and just make us feel good. 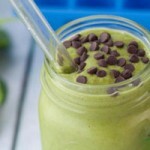 And who says you can’t feel good while you enjoy an ice-cream inspired smoothie? 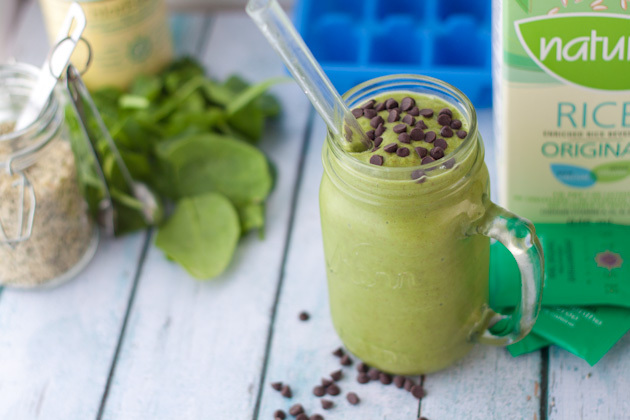 I wanted to make this smoothie free from the mint extracts so I used steeped tea instead! 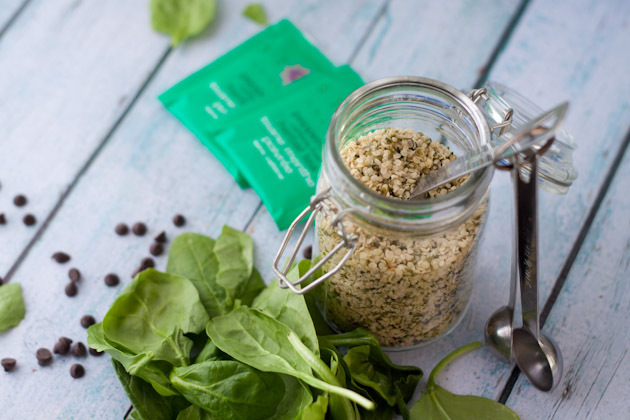 Not only does it give the smoothie a real mint flavor, it also allows us to cut the calories so that ingredients with a stronger nutrient punch; like hemp seeds, could be added. Steep the tea in the ½ cup boiling water until ready to use in the smoothie so that it’s really concentrated. Wait until the water has cooled, about 30 minutes. I just make my tea at night and let it sit on the counter overnight. 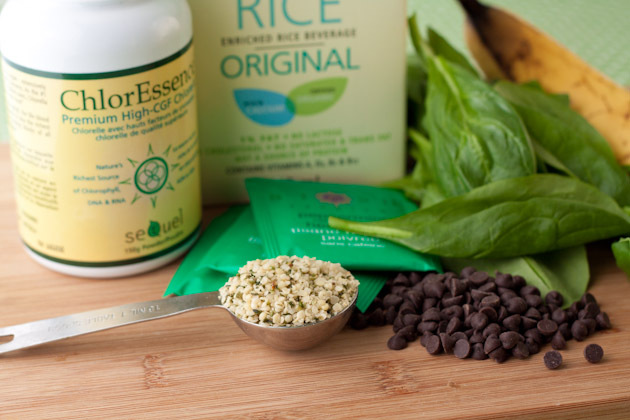 Place all ingredients but chocolate chips in your blender in the order of the ingredients listed. blend for 30 seconds or until smooth. Drop in half of the chocolate chips and pulse quickly. Pour into a cup and top with leftover chocolate. 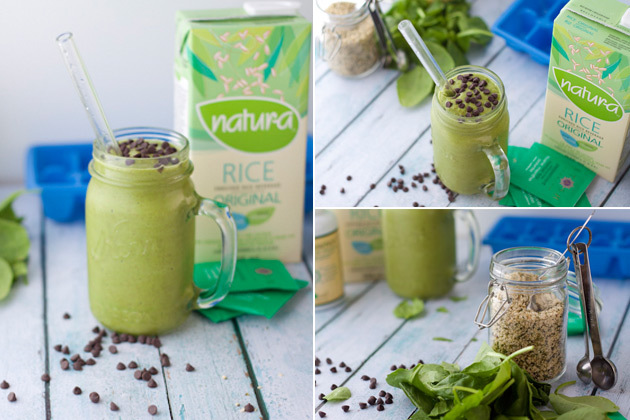 To boost the detoxifying and cleansing properties of this smoothie, you could add chlorella or spirulina powder! Did anyone else get fooled this April 1st? Surprisingly Pebbles was the one that got me this year. I let the dogs out into the backyard at 6am yesterday morning. It was a nice morning, so I decided to clean the deck a bit while they did their business. About 15 minutes later I called them in for breakfast but only Lexy came. I called again, no Pebbles. There’s a killer hawk in the neighborhood that likes to steal small dogs, but I was outside the entire time so I was sure Pebbles wasn’t stolen by the hawk… I called again, and again… of course this is when I began to worry. I raced back in the house searching high and low for that darn dog. I couldn’t find her after 10 minutes of searching so I went to wake Kevin. On my way to the bedroom I noticed my office door opened just slightly. I pushed it open and there was Pebbles, on my desk eating my breakfast. She just looked up at me like ‘Hey Mom, want some?’ I still have no idea how she managed to get back in the house, into my office and on my desk. That breakfast must have smelled pretty darn good! Lucky for me, I’d left my smoothie out on the counter so all she got was my incredibly lame fruit salad. Jokes on you little dog, jokes on you.